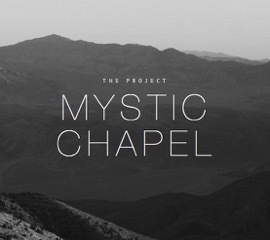 Mystic Chapel is the newest offering from The Project—musical artists Duane Arnold and Michael Glen Bell. Perhaps you know their first album, Martyrs Prayers (if you don’t, you should!). I grabbed a copy of The Project’s new CD just before Christmas, and it didn’t take me long to decide that this is the album that will journey with me through 2016. Why? Because Mystic Chapel is itself a journey, one that echoes the walk I find myself on. In word and song, Mystic Chapel tells the story of a man for whom faith is a distant memory. Weary from his search, the man finds his way to “a small clapboard building with a broken cross on a small steeple.” Once within, he dreams that he enters a garden and sees a stone rolled away. But is it a dream? Perhaps it is a vision and the man a mystic. Click here to read the rest of this review at the Ancient-Future Faith Network! And be sure to get your CD or download of Mystic Chapel at http://themartyrsproject.com. Today, the Church remembers Aelred of Rievaulx (1110-1167), abbot of the Cistercian abbey of Rievaulx in Yorkshire. I wanted to share with you a beautiful passage from his De institutione inclusarum (The Formation of Anchoresses) on praying—and more—for the world. It seems that we need these prayers more than ever today. 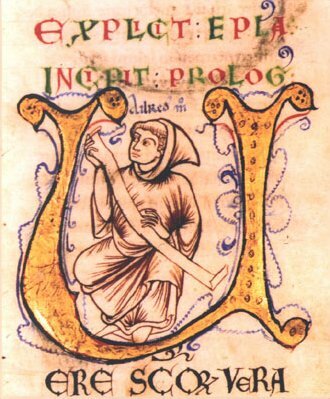 *For Crist Luve: Prayers of Saint Aelred Abbot of Rievaulx, trans. Rose de Lima (Den Haag: Martinus Nijhoff, 1965), p. 10. 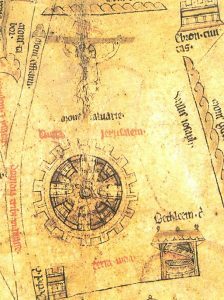 I suddenly recalled, this fourth week in Advent, that my book, A World Transformed: Exploring the Spirituality of Medieval Maps, contains a seasonal reflection! I decided to share it today as an excerpt. Read on for a gift from God via the wonderful world of the Hereford Map. I will never forget the first time I caught a glimpse of God’s plans for the world. I was a teenager, and it was Advent. On Christmas Eve, the church in which I grew up held a Festival of Nine Lessons and Carols, a type of service that originated in England in the early twentieth century. The lessons began with readings from the book of Genesis and proceeded through the Old Testament prophecies about Jesus before culminating in the familiar Christmas story from the Gospels. I loved sitting through this long service. The hour was late. The church was candlelit. The lessons brought us closer and closer to Jesus. All was anticipation. And I will put enmity between you and the woman, and between your offspring and hers; he will crush your head, and you will strike his heel (Gen 3:15). Waiting for Jesus, I was suddenly transported to the beginning of time. Christmas was revealed for what it is: not an isolated feast, but the center of a vast history that began in the mind of God and that will not end until the day of judgment. Driving home after the service, beneath a dome of glittery stars, I knew that Jesus was part of something incredibly big. And since I claimed Jesus, whose birth I was celebrating—or rather, since he claimed me—I was part of something big, too. What a wonderful moment. My place in the world, my significance in the grand scheme of things, was presented to me like a gift from God. Since that night, I have tried to hold on to this certain knowledge of my significance. But it’s difficult. The world seems bent on putting me in my place—a very small place. As we all do, I face rejection on a daily basis. I compare myself with other people and come up wanting. I feel misused and overlooked. Sometimes, at the end of a difficult day, it can seem that God himself has forgotten about me. The Hereford Map, ca. 1300. Image courtesy of University Library Groningen. Amazingly, even though this story began before time itself and reaches beyond the end of time, it is a story that has room in its narrative for each individual who encounters it in the present day. When we get lost in God’s story, we find ourselves. Bass suggests that we enter God’s story by celebrating the church year, which, through its liturgical seasons, takes us through key points in the “life of God.” I like the idea of paying attention to sacred history throughout the year, as I did at that Christmas Eve service long ago . . . 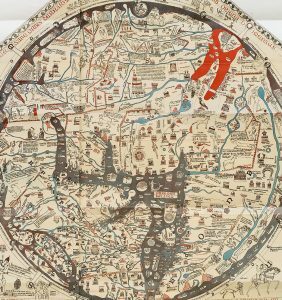 I find another point of connection to God’s story in the Hereford Map. Sitting down with a good reproduction of the map, I let history wash over me. My eyes roam over the map’s sacred sites, from Eden to Africa to Jerusalem to the gates of heaven. If you try this exercise yourself, you will see that the map organizes these sites in a particular way. It lays out salvation like a diagram. The creation and the birth of sin take place at the edges of the world, as if to show their distance from human experience and understanding. Jesus lies at the center. Time ends, and eternity begins, at the top. In between these pivotal sites in the history of salvation, there is a lot of room—all the room in the world. There is room for the medieval Christians who were the map’s first users, and room for you and me. Room for our stories. Room for our mistakes. Room for our redemption. Room to recover our significance. In fact, every follower of Christ finds herself on the map of salvation every day, in ordinary but breathtaking ways. Have you ever had a bad day? Have you ever let sin get the best of you and then knelt humbly to ask God’s forgiveness? That’s part of my day every day. It’s also part of the grand design of God. When we sin and ask forgiveness, we are playing our role in the drama of salvation—the very drama illustrated on the Hereford Map. We journey from the monstrous races at the edge of the world to the cross at the center. We make the journey of God’s saving grace . . .
Let us, then, learn to embrace our place in God’s plan. Let’s learn to think big. No more false humility. No more wondering where we belong or whether we matter in the grand scheme of things. We do matter. And we belong on the map of salvation. Dorothy C. Bass, Receiving the Day: Christian Practices for Opening the Gift of Time (San Francisco: Jossey-Bass, 2000), 80–81. Wow, I had forgotten how much I love my book! Let me clarify—I love what medieval maps allow us to see about God, his love, and his plan for humankind. Read more in A World Transformed. 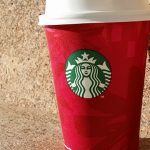 This year, as I’ve attempted to keep Advent and—of course—prowled social media, I’ve noticed some interesting practices here and there. So I decided it was time for an Advent round-up! This is not meant to be a definitive compilation, just some neat things I’ve found. Some are historical, some new, some strange, and others just kind of fun. Maybe there’s something for you. So here you go—10 Advent Practices for 2015! Rogier van der Weyden, Columba Altarpiece (detail). Note the crucifix hanging above the infant Jesus. 2. Look for the four comings of Christ. 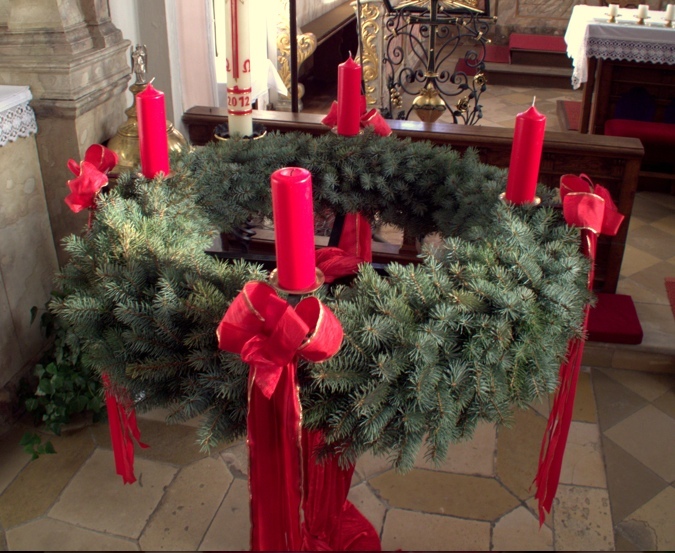 Instead of using the themes of hope, peace, joy, and love when lighting your Advent wreath, reflect each week on one of the four—yes, four—comings of Christ as taught by medieval theologians. I did some research on this and was surprised by the rich and complex tradition of Christ’s comings. 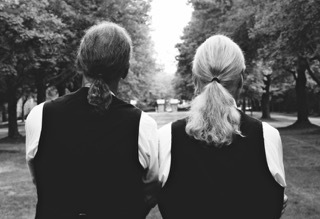 See my recent reflection on this topic. 3. Read Connie Willis’s Doomsday Book. I admit that this is a strange practice, and it’s a highly personal one. Almost every year, I read Willis’s time-travel thriller during the Advent season. Why? Set in December in medieval England (and 21st-century Oxford), it offers a totally unsentimental look at the kind of love and hope that pierce the darkest of human days. For more, see my review of Doomsday Book from this summer. 4. Celebrate the Stations of the Birth. 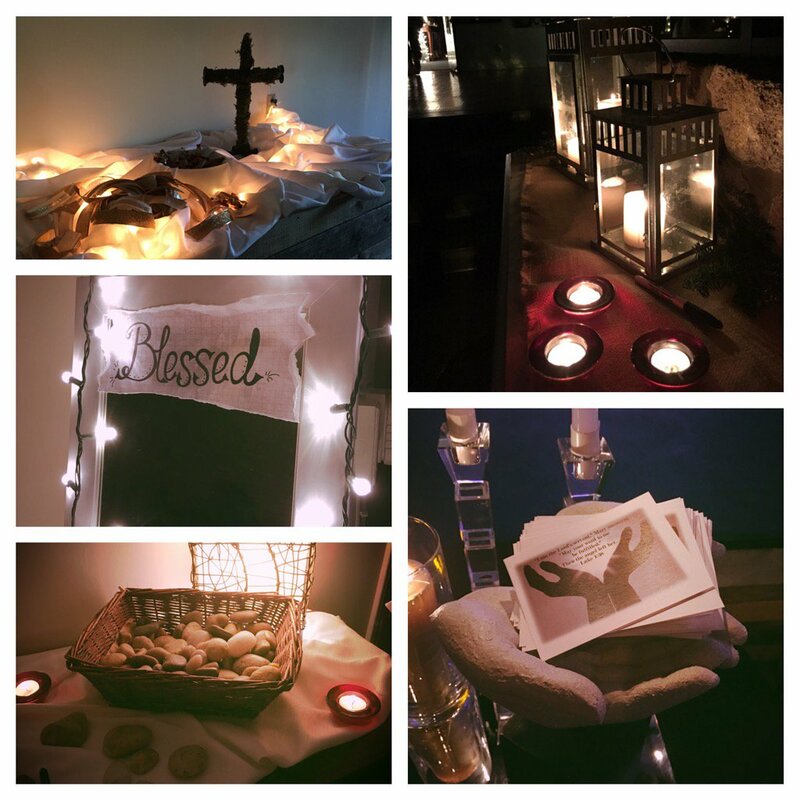 Led by Emily Stone, the women of Renovatus Church in Charlotte, NC began a unique practice this year— celebrating the Stations of Christ’s birth as an Advent parallel to the Stations of the Cross. Readings, poetry, and visual aids took participants through stages in Mary’s journey, including her response to the angel, her visit to Elizabeth, and Jesus’ birth. Each station helped the women prepare for what Christ is birthing in their own life. Doesn’t this sound like a neat tradition? 5. Wait. The Feast of the Nativity doesn’t begin until December 25. The four weeks preceding are a time of preparation. How can we spend some time this Advent preparing instead of partying? We may not be able to do much about office parties or Christmas music blaring in public. But how about in our homes? Perhaps we don’t put up the tree until Christmas Eve. Or we sing songs of preparation instead of Christmas carols. Worried you won’t get enough holiday cheer? Remember that the Twelve Days of Christmas follow Advent. They are a liturgical season of feasting unto themselves. 6. Read a poem a day. My Twitter friend Marguerite is having an all-poetry Advent (check the hashtag #poetryonlyAdvent on Twitter). She writes, “All my ‘recreational’ reading is going to be poetry. This will mean much more intense, careful reading.” Some of her favorites are Christian Wiman’s “Every Riven Thing” and John Donne’s “Batter my heart, three-person’d God.” Reading something completely different can slow us down and help us to pay attention. 7. 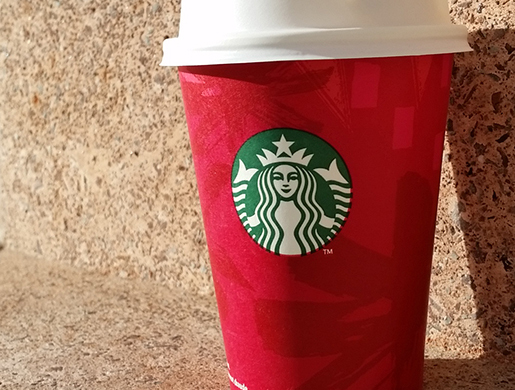 Walk into Starbucks and order your favorite drink in a new size—the (Ad)venti! 8. Do your shopping before Advent. This tip comes, again, from Marguerite. I imagine a whole new countdown—just 14 shopping days until Advent! By getting this task out of the way early, we can spend time preparing our hearts for the coming of Christ. 9. Ban violence. This is another medieval tradition, one I discovered on Medievalists.net. In the 11th century, a series of decrees called the Truce of God forbade violence (such as feuding, war, personal revenge, and military activities) during Advent. In 1063, the Bishop of Terouanne wrote,”You shall also keep this peace every day of the week from the beginning of Advent to the octave of Epiphany.” What if we banned violence—arguing, passive-aggressive behavior, baiting, and so on—in our own hearts and homes? What if we kept the peace this Advent? 10. Mix up your music. Kate is changing her listening habits this Advent: “No radio, more silence and classical music. 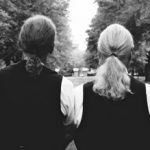 Deeper listening.” What might a little silence and more careful listening do for us this time of year? 11. Embrace the chaos. Here the truth comes out. How many Advent practices have I actually kept this year? Not many. The tree went up the Saturday after Thanksgiving (I blame the kids). I’ve picked fights (I blame the stress). I haven’t fasted (I blame . . . you get the point). Phil links to Paul’s letter to the Galatians: “You are trying to earn favor with God by observing certain days or months or seasons or years. I fear for you” (Gal. 4:10-11). I don’t know if I’m trying to earn God’s favor, but I do know that sometimes I can’t seem to do Advent. I like the practices I rounded up above and genuinely think they (or others) can help us prepare our hearts for the coming of Christ. At the same time, I realize that I can’t save the season—or myself. This awareness is perhaps my greatest practice. It’s why I need Jesus to come this and every year. How about you? How are you keeping—or embracing the grace of not keeping—Advent? 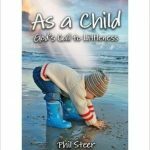 For the second week in Advent, I’m thrilled to host friend and author Phil Steer with a guest post that challenges the way we’re usually told to think about God. Read on to see how the “offense of the Incarnation” changes everything about our relationship to God and the world. The trouble with many people today is that they have not found a God big enough for their modern needs… It will always be by [a great effort of will that a person] either worships or serves a God who is really too small to command his adult loyalty and cooperation. We cannot know the unknowable. Our minds cannot contain the uncontainable. 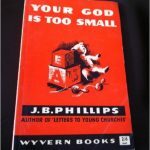 Surely Phillips was right: Our God Is Too Small. 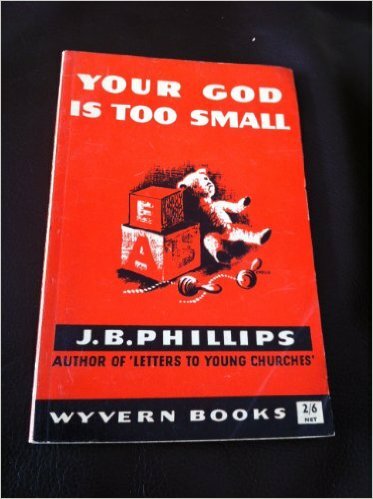 Whilst I agree with Phillips’s diagnosis (it is a superb little book, as relevant today as it was 60-plus years ago) I am convinced that we suffer equally from the very opposite malady: Our God Is Too Big. When God gave humanity the ultimate revelation of himself, he didn’t come in greatness and power and glory and splendour and majesty. Instead, he came as a little child, as a helpless baby, totally dependent on his parents for protection and provision, for all that he needed to survive and to grow. Indeed, more (or rather less) than this – for before becoming a child, before being born as a baby, Jesus was conceived and carried within Mary’s womb. He became for us God the Foetus, God the Embryo, God the Single Cell. Do these names for God shock or offend you? I’ll admit, I hesitated as I wrote the words. But perhaps this just goes to show how far we have failed to fully grasp the scandal of what God has done for us. Paul writes of the “offense of the cross” (Galatians 5:11) – is there not also the offense of the Incarnation? God becoming one of us, with all the messy humanity that entails. And this matters, because our view of God fundamentally affects how we relate both to God and to the rest of the world. Think about it. God humbled himself – literally, came down to our level – that we might see him as one of us and relate to him as one of us. Our God knows what it is to be human and is able to empathise with our weakness (Hebrews 4:15). Jesus came as the friend of sinners (Luke 7:34) that we might be called his friends (John 15:15). If our God is too big, we will never grasp this essential truth. Just as importantly, our view of God affects how we relate to the world. If our God is big and powerful, then we can think ourselves big and powerful too. “We are children of the King!” Yes, children of the servant King – the One who made himself nothing and came to the world in humility – in littleness. This is how we are to live in the world. God is so much bigger than we could ever conceive. But our Big God made himself small – smaller than we can truly believe. This is how he chose to reveal himself. This is what he wants us to see. And this is how he want us to be. For when God makes himself small, we have little choice but to make ourselves smaller still. Phil Steer is the author of As a Child: God’s Call to Littleness which is being serialised in the prayer and spirituality journal ‘Quiet Spaces’, published by BRF. He is married with three children, works in the City of London, and lives in Romford, on the London/Essex border. I’m heartened to see more and more Christians keeping Advent— not rushing to the feast, but spending time in holy expectation. The historian in me approves. When we observe Advent, we deepen our preparation for Christ’s coming by embracing the liturgical rhythms of the ancient Church. 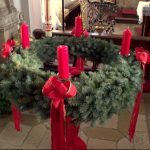 Some historical Advent practices, such as fasting, most of us do not keep today. 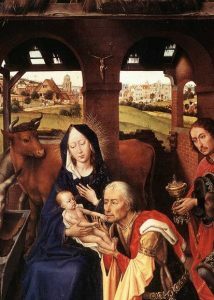 Others, like the annual Christmas pageant, are still going strong (in the medieval Church the pageant was performed by choirboys). This year, as I watch my daughters perform one of their own practices, I’ve been drawn to some wonderful medieval teachings on Advent. Perhaps I should say Advents. In one of his sermons for the season, written in the mid-twelfth century, Bernard of Clairvaux speaks of not one but three comings of Christ. A century later, Thomas Aquinas adds yet another. That’s three more comings than most of us prepare for. It has taken my two children to help me absorb what these four advents might mean for me. Christ’s first coming, no surprise here, is his historical advent. My daughters have developed an elaborate practice to prepare for this event. That practice? The manger scene. My girls set up their scene with the precision of an HGTV reality show. Everything must be just so. 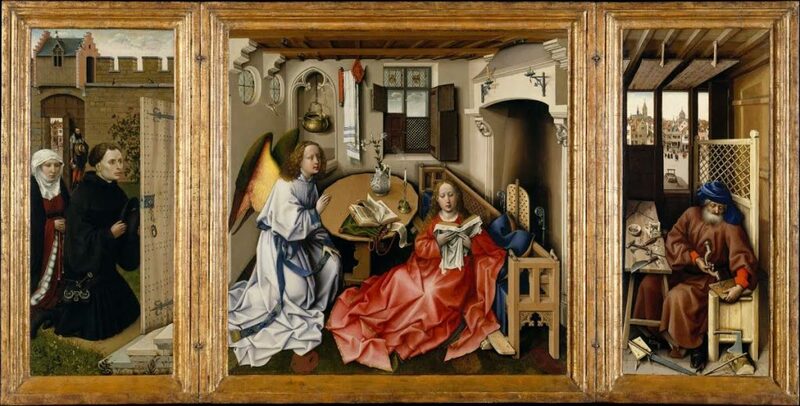 The picture on the box is consulted: Mary must stand here, Joseph there. The manger must be centered. Then and only then is the baby tenderly placed therein. But he’s not there long; Jesus requires much more attention than that. I sometimes think God sent his son as a baby for the benefit of maternally inclined four-year-olds. Click here to read the rest at the Ancient-Future Faith Network! New subscribers will receive a free download of my new e-book, 7 Ways the Ancient Church Saved My Faith.